The Cisco® Learning Credits Program enables you to purchase training when buying new hardware, software, or support and services. The program ensures that you receive the highest quality of training through CTU Training Solutions. 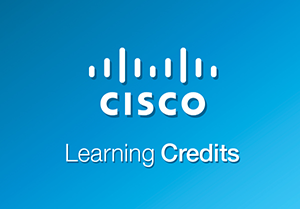 Each Cisco Learning Credit is valued at US$100 and valid for one year from the date it is issued. Credits are listed on the Cisco global and wholesale price lists. How do Cisco Learning Credits relate to Cisco Career Certifications and Partner Specializations? Cisco Learning Credits are used as payment for Cisco authorized training, including training that prepares individuals for Cisco Career Certification exams or channel partner specializations. The ability to get the most out of your Cisco network investments and meet your business goals is directly tied to the skills and expertise of your IT staff. With the right training, your organization will retain a competitive edge and remain ahead of the technology curve. Redeemable through CTU Training Solutions, Cisco Learning Credits are an easy payment method for Cisco authorized training. They enable you to increase your productivity and safeguard your training budget by addressing your training needs at the time of the product purchase. How many Cisco Learning Credits do you or does your organization have available to redeem for training in your software licensing agreement*?